Since we didn’t sell the tote that we made for Not Forkchops, and since not everyone was able to go by The Department to get one (they were free, guys! There was some misunderstanding about that when I originally posted about them, but they were promotional), we’ve decided to give a few away here in conjunction with Imm Living. As you may recall, this tote was made for a special event, with lyrics are from a song by the Brazilian band Os Mutantes. I have been shying away from hosting giveaways over the past year, but I thought I would make an exception for this one. Since today is a leap day, I thought it seemed auspicious-ish. We have five totes to give away, and two of them will include a special gift from Imm: a heart or a horse head ceramic ornament container. The ribbon can be unthreaded to place a tiny note or gift inside, which is pretty adorable. To enter, please leave a comment below. Mentions on Twitter (be sure to mention @fieldguided and @immLiving so I can track them) will get extra entries. I will choose five winners at random on Monday, March 5: three will win a tote, and two will win a tote plus an ornament. This giveaway is open internationally, so all entries are welcome. Good luck! fantastic! hope i get lucky! Those ornaments are beautiful! And this librarian can always use another tote bag to fill with books. Such a lovely tote and cute ornaments! I love an auspicious-ish giveaway! This tote is fantastic, Thanks! happy leap day! hope i get to be so lucky! These are gorgeous! Thank you for the great giveaway! such an awesome tote and lovely ornaments. thank you for the offer! What's inside ?? I wanna know. Happy 29th. i've been craving for your totes for ages. this is the most perfect giveaway ever! lovely as ever. thanks for such a wonderful giveaway! ohlala! Beautiful! I would love this! count me in. such a pretty tote! The totes are so beautiful. Thank you for the giveaway! Ah, that's great. That horse is sweet. Would love another one of your totes to add to my collection! Happy Leap Year! such a gorgeous tote. reminds me a bit of the endpapers of 1Q84 - perfect! Oh yes please. So gorgeous. @lolabythesea on twitter. You make me wish I was Canadian. This is my favorite tote design to date. Being an Os Mutantes fan played a role obviously. such a gorgeous tote. reminds me of the endpapers of 1Q84 - perfect. how lovely. thanks for hosting such a wonderful giveaway! I woud love a leap year tote! great tote and beautiful ornaments. thanks for the chance to win! I never never never never enter giveaways but I wanted this tote the second I saw it, so can't resist!! Thanks for giving us the opportunity to win one!! Oh wow! I would be so honoured to win either the tote or ornaments! Both are SO lovely! Those ornaments are so cute! Beautiful! Love this leap year! Happy leap day! Love this giveaway. What a fantastic giveaway! My fingers are crossed. Ah I remember you posted these totes some time ago, and that I was bummed they weren't up for purchase.. I love the totes, they are so sophisticated. love the tote! and a leap day giveaway. a perfect giveaway just as my old university tote is giving way from the bottom! if there's anything i need right now, it's a new canvas tote. They were free?! Que me regretting not making my way over to Not Forkchops, I really wanted to go, too. Thanks for another chance to receive this special edition tote and an adorable ornament! Yay! I love your totes. Cute! I love the tote too! I really like this design and would love to own one. They were free? Oh to live in Toronto! Thanks for the chance to win one - I like the idea of a leap year giveaway exception. Aww all the items are gorgeous. Thank you so much for this! Oh, I love Mutantes!!! Such a great reference to have in a bag! Love it! This is beautiful, that tote bag is simply divine as well with the ornaments..breathtaking! I adore this tote! It would be a nice addition to my tote collection (that includes my beloved "there is thunder in our hearts" tote! Can't wait until the scarves come out! I am dying to get my hand on one! This is one of my favorite songs ever! I would love to win one. Thanks for the giveaway! I always think of frogs when I think of the leap year. How silly! This is one of my favorite songs of all time! I would love to win one! Thanks for the giveaway. Happy leap day!! What a great tote design and hideaway ornament idea. I actually read about this on twitter (from Kate Miss). I never win anything but here's to hoping I get lucky. Love this tote. i'd love to win one. those ornaments are pretty awesome, too. please enter me, those totes are beautiful! I would love to carry this tote! Ahhhh love!! What a great giveaway - going to tweet about it now! thank you for combining two things I adore: os mutantes + totes! throw in an adorable heart ornament and I'll be in a swirling heaven...such a perfect little giveaway. great tote design. giveaway from the artist herself is the best! love your blog, and i use one of your other totes everyday! A tote please, a tote, my kingdom for a tote! what a great tote. thank you! Thanks for the giveaway! I was pining for the tote in NYC. That tote is fantastic! I'd love to be entered. Please and thank you! These are lovely! awesome giveaway! that tote would be perfect to help my spring transition. i would absolutely love one of those pretty totes! Thank you for making the world more beautiful! Fun. I really like the tote. These are super darling! flicker@gmail.com. I'm pretty obsessed with lunar imagery right now. Do count me in. Thank you for your generosity and gorgeous blog as always. I'd really love a tote so i could feel like i'm on an intergalactic space mission. complete with sparkly nails. <3 Thank you! I really can't say no to giveaways..ha! Amazing tote as always! Thank you. Love the tote! So cute! Love both of these items! So cool! I looked up the lyrics on the tote bag and they are lovely! woho! sounds fun. i'm in! The tote is fantastic and the ceramic pieces would be fantastic for storing sweet messages! I would love to own one of those totes, I'm a portuguese living abroad so anything that has a little portuguese/al in it makes me proud and happy. Plus they're just marvelous! The tote is fantastic, would love to get one. Count me in! Such a nice tote. The totes are so gorgeous! And I love those ornaments! They remind me of one I had when I was little - a ceramic ballet shoe with real ribbons attached. I absolutely LOVE this tote. I think the design is brilliant. Simple, elegant, yet smart. I am absolutely a fan. If we miss the give away, are there opportunities to purchase them? Am compelled to enter this (despite the odds diminishing with every extra second it takes me to scroll down through the comments) because it's open to international readers, and I am an international reader! Hurrah! Count me in too! Beautiful totes and ornaments! oh la la to the totes and that horse head! pretty - as always. LOVE the tote!!! oh no, so sad you can't buy these, they are beautiful! but thanks for giving us the chance to win! Love this tote! Glad to have a chance at one. Oh man, I'd very much like to win--especially since the lyrics you chose are from Os Mutantes, such an excellent band! I love a good tote! And Os Mutantes is one of my favorite psychedelic bands. those ornaments are so very sweet! wow! and I love this tote! Beautiful ornaments! wow...and I love this tote! Beautiful ornaments! That horse ornament is the cutest thing ever. I carry your "Blame it on my wild heart" tote all the time and would love to add this to the rotation. WOWOWOWOWOW!!!! This is so exciting! When I first saw this tote and saw that it was not going to be for sale I was saddened since I love anything moon related! So jazzed you decided to have a giveaway for these lovelies! Oh I'd love to have one of these! The ornaments are adorable as well, so I'm keeping my fingers crossed. 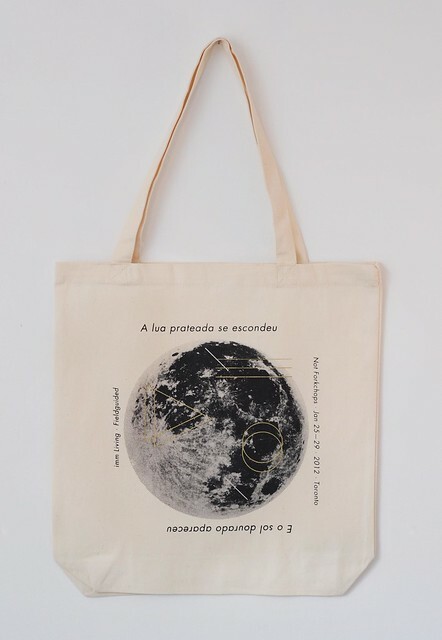 I would be very happy indeed to add your moon tote to my collection of tote bags! Yum yum yum, I'd like one! I would love to see those fab totes in London! Would love to win, inspired by all things celestial at the moment - so the moon tote would be perfect for Spring! I've been practically obsessed with this tote ever since you've posted it! Ah, so exciting! I'd love one, those totes are great. so lovely! I'd be so happy if I won. so in love with the totebag!!! awesome, this is one of my favorite totes you've done!! ooohhh! uauauau! é tão lindo! I love os mutantes! oh god make me a winner! OH MY GOLLY THE BAG IS AMAZING! Want want want. So beautiful. What a sweet giveaway! And perfect timing, since I recently lost my Thunder tote. sweet! I wish that bag was in the shop - I'd buy it in a heartbeat! i need a new tote. pick me!! nice bags! In fact, very useful. Ooo pretty :) I never enter giveaways but I just have to enter this one! I've got to throw my hat into the ring! I already own one fieldguided tote, this would be another to add to the collection. Such a lovely tote! It is too bad I'm not on Twitter. Hope I can win something! ooo. I'd love to be an owner of this beauty!